Discussion in 'Birds' started by MGlennn, Jun 10, 2005. They will rock the feeder back and forth to get the liquid to come out in order to drink it. I am told they may do this when outdoor conditions are dry/hot...but I am suspicious they just like stealing the sweet stuff from the hummers. Mike - thanks for the information! 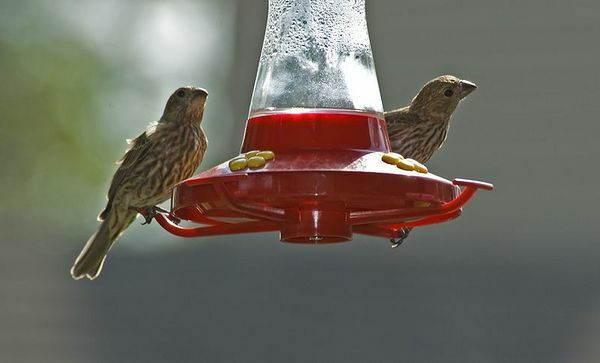 Do you have other feeders in the area for the finches? That may also help. Personally, I like making the little suckers work for their treats, so I remove the platforms so they have to hover while they feed. 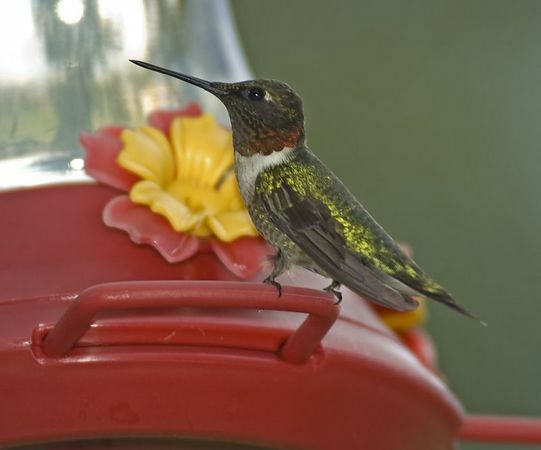 It makes for better photographs, and makes the feeder unfriendly for thieves and imposters. 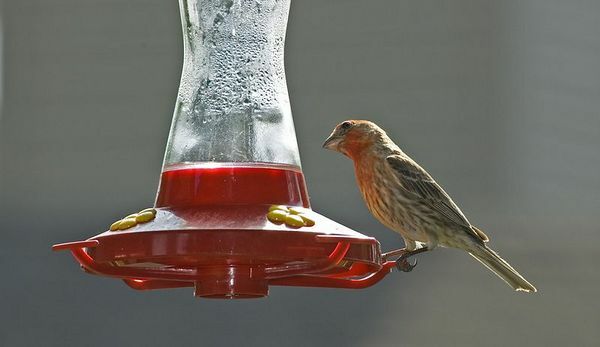 Gee, I recently bought a feeder...but it looks like I got the "wrong" kind. Haven't seen birds near it, though, of any kind. Wonder what I'm doing wrong. Perhaps I should call Frank in for a consultation. P.S. Fortunately the hummers really like my Mexican sage. I planted more for them this year. There isn't any "wrong kind", Virginia. If it has the right mixture of sugar and water, they'll drink out of anything. First thing I'd do is give the feeder a good scrubbing. There might be a bad "taste" due to manufacturing contaminants. Then try enriching the mixture. Sometimes I'll make it as sweet as 2:1. Finally, make sure you hang it near some trees, so they have protection. They don't like feeding in the open. Frank, I have the feeder in the open sitting on top of a 2 ft. high brick wall. I don't really have any good support unless I hang the feeder in the shade in the backyard...not many flowers grow in the shade so I didn't think this would be a good choice. I guess I'll clean the feeder and try a new batch of "syrup" with the higher sugar content and see what happens with the current setup. More later on this saga of catching these beautiful birds! Ahh Ha...!! !....thanks UF :idea: (light goes on in head)...finches can't hover like hummers can.....good solution to problem....now to find my wire-cutters ! !